Phuket’s “Old Town”… On the east side of the island is Phuket’s old colonial town. Great music houses, art galleries, restaurants and coffee shops abound. 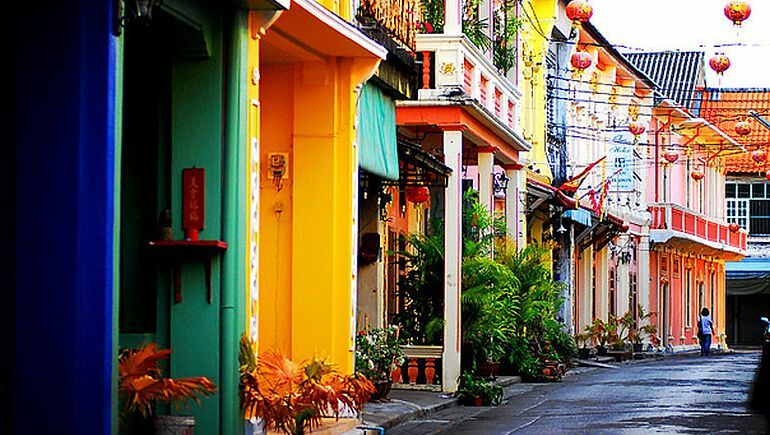 Everyone loves to find great shopping bargains, and colonial Phuket Town offers many options and back-street places to find that special gift at a great price. Villa renters can rub elbows with the locals in this traditional old town. Buddhist Temples … Wat Chalong and the Big Buddha are perhaps the most famous temples on Phuket Island, and are well worth a visit. But there are a dozen other temples that are also quite amazing. Our favorite temple has a massive golden statue of Buddha, and is hidden behind Khao Rang, just north of Phuket Town, but even many of the locals don’t know about it! The “other” Islands … To the east of Phuket lies the Andaman Bay, home to several of Thailand’s most famous islands. Koh Phi Phi is perhaps most renowned, with its amazing dive spots, spectacular geography and pristine beaches, this wonderland lives up to its reputation as a must-see spot. Phang Nga’s islands are also a must-see, with mysterious-looking limestone-cliffed islands covered in jungle. Beautiful waters and secluded beaches add to the allure of all of these islands. Muay Thai Boxing… While perhaps not for the faint of heart, Muay Thai boxing offers a unique glimpse into a part of the Thai culture that is easy to miss. There are many venues spread across Phuket Island to take in an evening of matches. But for a truly unique experience, why not join the fray for a day or two? Many of the famous “Muay Thai Camps” on the island host short-term tourists for training sessions that can run from a couple of hours to days or weeks. Cape Panwa … South of Phuket Town and bordering Chalong Bay is the beautiful Cape Panwa. Locals will boast that this is where the King’s family stays when they visit. High-end hotels, secluded beaches, boutique restaurants and a more traditional brand of Thai people await you in this lovely piece of Phuket. Villa renters can find many ways to stay away from the madding crowds of Phuket’s beaches and busy nightlife. These five ideas are just a start, find your own “off the beaten path” places by exploring Phuket’s east-side.